A long time ago, when the Great Wall stretched across China, there lived an Emperor and his daughter, Ming-mei. A huge palace sat at the bottom of a hill surrounded by a high stone wall. This kept the Emperor and Ming-mei safe from invaders and wild animals. Inside, forests of bamboo grew thick and lush. 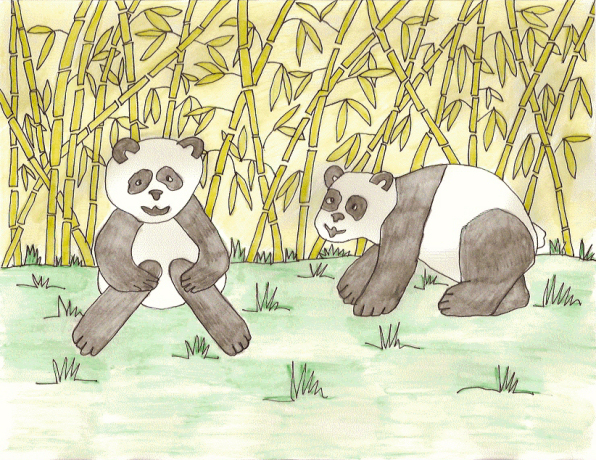 The Emperor’s two royal pandas munched on the leaves, stretching their reach to grab the tastiest ones at the top of the bamboo canes. When the wind blew, little pieces of bamboo struck against each other, sounding like a symphony and giving joy and peace to those who heard it. Protected from the cold by the height of the walls, cherry, orange, and fig trees blossomed. Their fragrance floated up to the palace. Ming-mei often stood on her balcony, where she could see everything in her father’s kingdom. When she smelled the orange blossoms, she held her dress out to the side and danced through the palace. Ming-mei often walked around the edge the ponds. White lotus grew from lily pads floating on top. Fat green frogs hopped from one to the other. Koi fish swam below the surface. Their fins and tails swayed back and forth in the water. She loved everything about her father’s palace, but her favorite place, the flower garden, delighted her heart, especially in spring. Red tulips, yellow daffodils, and grape hyacinth bloomed, springing up between the peonies. When the sun shone on the flowers and the morning dew glistened, she’d pick a bouquet of daffodils for her father, the Emperor. Nothing made Ming-mei happier than being in her garden. Late in spring, hundreds of butterflies appeared – blue ones, lavender ones, pink, yellow, and green ones. Ming-mei watched them flutter from flower to flower, gathering pollen. All summer long they stayed in the palace garden. Sometimes Ming-mei spread her arms out and flapped them up and down, pretending to be a butterfly. Crickets chirped, singing nighttime lullabies to Ming-mei, rubbing their wings together after the sun went down. She slept well; knowing the loving arms of nature surrounded the palace. In a far off kingdom, there lived an evil Emperor named Suanmi. Instead of flowers and butterflies, his palace was decorated with statues of ferocious lions, beastly dragons, and other hideous and ugly creatures. No flowers grew; no fish swam in his ponds and no water lilies made homes for frogs. No crickets chirped a song. Red dragonflies hovered around the palace making a noise like roaring flames. Emperor Suanmi found no joy in life and wanted everyone to feel unhappy and miserable. One day, Ming-mei woke up and heard music coming from her garden. She ran to the balcony to see what it was. The butterflies danced in a circle, celebrating the ending of summer. Their wings touched, making an umbrella of gossamer rainbows. The frogs croaked a rhythm, boom-dee-boom-dee, and the bees buzzed and hummed. The koi fish sprayed water high into the air; each droplet catching the sunlight, shimmering with color, like magical prisms. Ming-mei gasped with delight and ran to get her father. While Ming-mei looked for the Emperor, dozens of red dragonflies flew over the palace wall, intending to put an end to the celebration. Their wings beat so fast that they stirred the air, making fire. They raced toward the flower garden. Flames spread, setting the bushes on fire, singeing the butterfly’s wings, and chasing the nightingale’s from their nests. 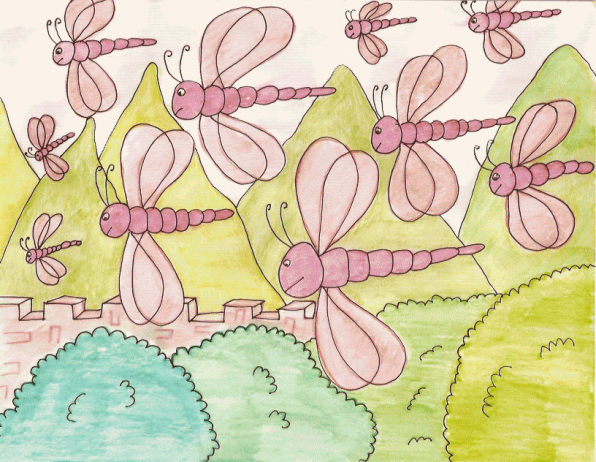 After destroying the beautiful garden, the dragonflies flew back towards Emperor Suanmi’s kingdom. The koi fish sprayed water on the butterflies and crickets, dousing the flames. When Ming-mei and the Emperor reached the garden, they stood with saddened hearts. Instead of velvety petals and soft, hairy leaves, they found destruction. Ming-mei fell on her knees and sobbed. The Emperor wiped the tears from his cheeks. He knelt next to his daughter and picked up one of the butterflies, holding it gently in the palm of his hand. He stroked its damaged wings and feathery antenna and then lay it down on the charred ground. Summer passed and autumn rains fell on the garden. Soon winter snow dusted the ground with an icy whiteness. Every day Ming-mei stood on her balcony and looked down upon her garden, remembering the beauty that once stood below her. When once again, the first bird landed on the palace wall, ushering in spring, Ming-mei noticed something. 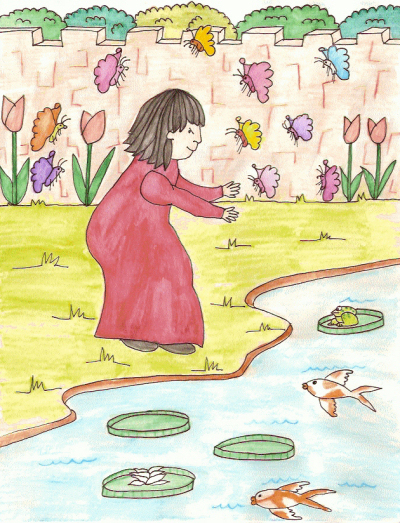 She ran down to the flower garden and saw tiny green shoots bursting through the snow. Day after day they grew taller. Soon buds appeared, and then the daffodils bloomed. Peonies burst forth with magenta flowers. Tulips spread their apple-red petals. Ming-mei’s heart swelled with joy when the first butterfly fluttered among the daffodils and the first cricket sang her a lullaby at night. By mid-summer Ming-mei’s garden, full of life and energy, once again brought laughter and harmony into the Emperor’s kingdom. The frogs jumped upon the lotus pads. The koi fish swam through the ponds, and Ming-mei danced through the palace, fluttering her silken butterfly wings in rhythm to the boom-dee-boom-dee of the frogs and the buzzing and humming of the bees.